As a tireless supporter of several cultural, philanthropic and civic endeavors, Joan H. Weill commits a great deal of her life to public service and education. Mrs. Weill joined the Board of Alvin Ailey Dance Foundation in 1994 and has served as its Chairman since 2000. Under her leadership, the Board has developed key priorities to help the organization reach its programmatic goals and maintain a strong financial standing. Joan, along with her husband Sandy, was instrumental in the building of the Ailey organization’s permanent home, which is named in her honor, The Joan Weill Center for Dance. The building, completed in 2004, is the largest dedicated to dance in New York City, the dance capital of the world. The Weills continued their leadership roles as co-chairs of The Next Step: The Campaign to Build Ailey’s Endowment to commemorate Ailey’s 50th anniversary in 2008 and secure the future of the organization. Mrs. Weill has worked with great enthusiasm and heart to advocate, promote and garner support for the Ailey organization, most especially for Ailey’s innovative Arts In Education programs that reach more than 100,000 underserved youth across the country each year. In addition, Mrs. Weill is the most recent Chair of Paul Smith’s College of the Adirondacks, having spearheaded the College’s transition from a 2-year to 4-year institution. Paul Smith’s excels in forestry, culinary arts, hospitality and life sciences, among other curricula. Mrs. Weill is Co-Chair of the Advisory Committee of the Weill Music Institute at Carnegie Hall, which promotes music education in classrooms around the world. Mrs. Weill’s dedication to women’s health issues led to her appointment as Co-Chair of the New York Presbyterian/Weill Cornell Medical Center’s Women’s Health Symposium. Long an advocate for the elderly, Mrs. Weill is also an Honorary Board Member and President Emeritus of Citymeals-On-Wheels. 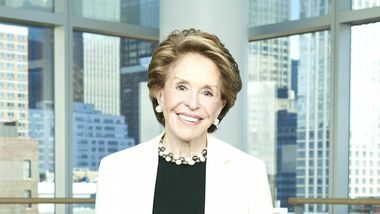 Mrs. Weill’s personal commitment to public service also extends to many of the activities in which Mr. Weill is involved, including the National Academy Foundation (NAF), Weill Cornell Medical College and the New York Presbyterian Hospital, where she serves on the Executive Committee of their Lying-In Hospital. Mr. and Mrs. Weill are recipients of the 2009 Carnegie Medal of Philanthropy Award in recognition of their philanthropic efforts. Mrs. Weill is a graduate of Brooklyn College with a bachelor’s degree in elementary education. October 25, 2018 (NEW YORK CITY) – As a centerpiece to its yearlong Ailey Ascending 60th Anniversary celebration and a kickoff to its five-week holiday season, Alvin Ailey American Dance Theater will host a star-studded gala benefit on Wednesday, November 28th at 7pm, complete with a performance for the ages at New York City Center and party at the New York Hilton Midtown Grand Ballroom. The Honorary Chairs for the evening are screen icons Angela Bassett and Cicely Tyson. Bassett, a Golden Globe Award winner, stars in the hit television series 9-1-1, and was most recently featured in the 2018 blockbusters Black Panther and Mission: Impossible – Fallout. Tyson – known for a myriad of roles across television and film, including Roots, Fried Green Tomatoes, and most recently How to Get Away With Murder – has received three Emmy Awards, a Tony Award, the Presidential Medal of Freedom, and on November 18th will make history as the first black woman to receive an Honorary Academy Award. (New York) November 9, 2017 – On Wednesday, November 29th at 7pm, Alvin Ailey American Dance Theater’s five-week holiday season kicks off with a star-studded gala benefit, including a performance at New York City Center and party at the New York Hilton Midtown Grand Ballroom. The Gala honors Ailey Board President Debra L. Lee (Chairman and Chief Executive Officer of BET Networks) for her commitment to the advancement of arts and culture and her dedication to the organization, which has helped steer Ailey to success since she joined the Board in 2002. Honorary Chairs for the evening are music and film stars Queen Latifah and Janelle Monáe. NEW YORK, NY, October 19, 2017 — At a festive ribbon-cutting, celebrated on the evening of October 18, leaders of the Ailey organization joined with dancers, students, donors, and friends from New York City’s dance community to open The Elaine Wynn & Family Education Wing, a 10,000-square-foot expansion of Ailey’s permanent home, The Joan Weill Center for Dance. It was 1994, and Alvin Ailey American Dance Theater was onstage at the Apollo Theater. Backstage, word was spreading. Joan H. Weill is going out with a bang. After her 14 years as chairwoman of the Alvin Ailey Dance Foundation and 20 years on its board, the company on Thursday evening planned to announce that more than $40 million had been raised in honor of her retirement.